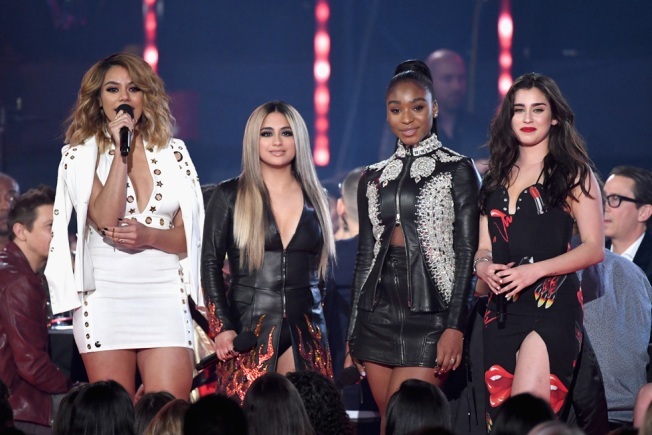 In this file photo, (L-R) singers Dinah Jane, Ally Brooke, Normani Kordei, and Lauren Jauregui of Fifth Harmony speak onstage at the 2017 iHeartRadio Music Awards at The Forum on March 5, 2017 in Inglewood, California. The group members, Dinah Jane, Normani, Ally Brooke and Lauren Jauregui announced the news via Twitter Monday. They attributed the hiatus to their desires to pursue "solo endeavors." "Reflecting on the past six years since we started on "X-Factor," we've realized just how far we've come and we appreciate everything so much, more now than ever," a note from the group said, citing their start on the British show. "We've really had one hell of a memorable journey together and can't begin to express our gratitude to y'all for coming along with us on this wild ride!" The note continued, "After six years going hard, non-stop, we also realized that in order to stay authentic to ourselves and to you, we do need to take some time for now to go on a hiatius from Fifth Harmony in order to pursue solo endeavors." They then thanked their fans. "To out Harmonizers, thank you for everything we have been able to build as Fifty Harmony. With your love and encouragement we will continue to build on ourselves, support one another in everything we do, and keep making you proud, each other proud and ourselves proud." They concluded, " We do have some upcoming shows through the end of the year which will still happen as planned, and we can't wait! All our love, from the bottom of our hearts, Dinah Jane, Lauren, Normani and Ally xoxoxo." They concluded, "We do have some upcoming shows through the end of the year which will still happen as planned, and we can't wait! All our love, from the bottom of our hearts, Dinah Jane, Lauren, Normani and Ally xoxoxo." Group member have already started pursuing solo opportunities. In February, Normani recently released her single "Love Lies" with Khalid. She also appeared on the most recent season of Dancing With the Stars and made it to the finale. Dinah Jane also released "Boom Boom" with RedOne, Daddy Yankee and French Montana in Oct. 2017. However, these weren't the only artists to explore solo opportunities. Lauren released "All Night" with Steve Aoki in January and Ally dropped "Perfect" with Topic that same month. Former group member Camila Cabello left the group in December 2016. "After 4 and a half years of being together, we have been informed via her representatives that Camila has decided to leave Fifth Harmony," the group's statement read at the time. "We wish her well." 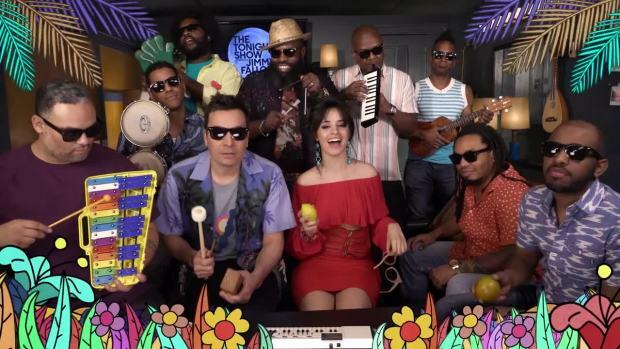 Camila Cabello joins Jimmy Fallon and The Roots in the "Tonight Show" Music Room to perform her international hit "Havana" with classroom instruments. The group's fans became the "fifth" member. The artists had also opened up about the struggles of being in the industry before. "They sell you this ­present of rainbows and butterflies, and as a 16-year-old that's what I bought. It's why I did X Factor and why I ended up in a group," Lauren said in an interview with Billboard, "But then you're working so hard, so young. [Meanwhile] my friends are in college, ­telling me about their days and what they're studying. You're having to put on a smile on a red carpet. It's like, 'Who am I? Am I for myself or for this?'"